We all know where Google stands with regards to guest blogging. Time and again, Google has reiterated to website owners and search engine optimizers that guest posting for illegitimate purposes of link building can be dangerous. But does this mean guest blogging is bad? Not really! It actually means that guest blogging is being done in a bad way. Guest Posting errors – What’s wrong with it? Traditionally, guest blogging has always followed some kind of special formula. Let’s take a quick look into what it is and what is wrong about it. Firstly, you have to create a piece of content which will be interesting to other websites. The content should include keywords if you want your website to rank and should also have backlinks to your website. The content should be full of keyword-rich anchor texts. Jot down the names of the websites which may feel interested in posting the content that you create. Approach them with a smart pitch which doesn’t sound promotional and wait for a response. You could even spam the heck out of as many sites as you can. Negotiating with other websites which don’t show interest in your content, to post it. Getting the content to be posted somewhere in the internet. Praying that the site doesn’t face any other SEO issue and that it benefits your website. What is so wrong about the above listed process? The rate of success is immeasurable: Although there are no official numbers but it has been seen that the acceptance ratio for the pitch to succeed is less than .01% and this means that you have to send numerous mails to numerous sites only to get a single piece of content published. There’s no guarantee that your content will be published and hence this means too much work for very little gain. It’s tough to differentiate between legal pitching and spam: Previously, people would pitch website owners with content. The difference was twofold. There was not enough competition and hence it was pretty easier to gain attention. We were trying to establish leadership or put the client’s point of view in front of users. The actual mechanics of the guest blogging technique is pretty easy to understand. Here are the steps to take. Recognize influencers of industry who communicate well: No, it is not always important to have a good website for SEO but they must have a decent following. In case the industry influencers are active on social media, it is even better. Invite the industry influencer to write: You could possibly invite them to write on your blog, write some newsletter or wherever you think it could generate links. Publish content on your site and promote it: It is vital for you to highlight how you could promote the content of the industry influencer to your audience. This is all a strong benefit for them. What makes this form of Guest Posting popular? 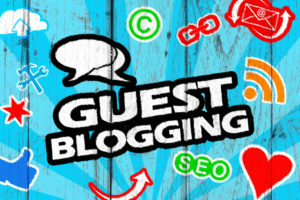 This form of guest posting has become effective but why? People can link to their own things and once you give them a platform, they will inform their followers about you. They will keep building links for you. In short, people self-promote themselves. This can be worth the effort. One more reason is that it’s not cheating in any way. So, we see that guest blogging should be done in such a manner that it doesn’t make Google angry as once it does, you are sure to be penalized. Fix the issue of fake reviews – Few worthy suggestions for dear Google!